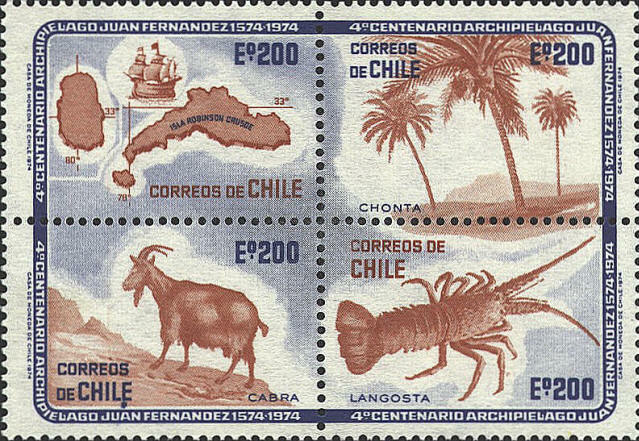 In 1704 Alexander Selkirk was marooned on Juan Fernández Island 414 off the coast of South America due west of Santiago, Chile. He lived there alone until 1709 when he was rescued by Captain Woodes Rogers, whose pilot was William Dampier, the privateer with whom Selkirk had quarreled before he was put ashore on Juan Fernández. After his return to England in 1711 his story was written up in an essay by Richard Steele, “The Englishman,” 1713. Daniel Defoe based his novel, The Life and Strange Surprizing Adventures of Robinson Crusoe, of York, Mariner: Who lived Eight and Twenty Years, all alone on an uninhabited Island on the Coast of America, near the Mouth of the great River of Oroonoque; Having been cast on Shore by Shipwreck, wherein all the Men perished but himself. With an Account how he was at last as strangely deliver’d by Pyrates, 1719, on Steele’s essay.